Lahore: “Arieb Azhar is the earthman because his music represents something that is pure and sincere,” says Bahrain expatriate Omar Qureshi, who is studying music in Pakistan. Azhar’s sublime musical abilities first made headlines with the success of his musical rendition of the spiritual poet Khwaja Ghulam Farid’s poem “Husne-Haqiqi” in “Coke Studio”. When one hears Azhar, it is his voice which quickly grabs one’s attention, while his poetic knowledge helps explore and challenge listeners spiritually by connecting various cultures, thoughts and ideas onto one platform. Azhar gave an acoustic performance to a select crowd of music aficionados and fans on October 2 at The Guitar School in Lahore. The night was marked by Azhar’s effort to explore diverse musical styles. His vocal versatility was also on display, as he sang in many languages including English, Urdu and Punjabi. “Sufi poetry was written by ordinary human beings, but I feel that in our culture the status and sanctity of poetry discourages ordinary people from experiencing these verses,” states Azhar. Azhar will be releasing two albums in the near future. He has lent his voice to a Croatian experimental electronic album, which will be a slightly different from his signature folk and blues dominated music. The artist confesses that it had been a while since he has released an album, so, to compliment the electronic album, he is working on a second album that will maintain the singer’s signature style. The singer will start recording in two weeks time. During the concert, Azhar covered American singer Frank Sinatra’s “My Way”, and turned William Yeat’s poem into a musical composition. One of the highlights of the night was his rendition of the Central-Europe Serbian-Croat song that was sung in an exotic gypsy language. The folk song is a farewell conversation between two lovers before they join the caravans and go in different directions. The singer explains that he is an admirer of poetry, but does not consider himself a poet. Despite this, his delivery of poetry is very unique and original. For example, during the introduction to his song, “Hum Charsi Bhangi Hain”, Azhar gave a well-versed and spiritual context to the poem, by explaining what the poem means to him and what he feels the poet is hinting at. The versatility with which the band — consisting of rhythm guitarist, a flute and a table player — was able to explore different genres through indigenous instruments was interesting to witness. Junoon frontman Salman Ahmad uses the same acoustic guitar aligned with the table technique during his own concerts. The combination, however, can have limitations when one attempts to play more Western oriented tracks. Azhar, however, knows what sound he is trying to achieve and knows how the instruments can be coordinated accordingly. For instance, the classical Spanish guitar rifts complemented by a classical flute solo can bring mellow eastern folk sound, reminiscent of music from central Europe. The Sufi singer remains optimistic about the potential of Pakistan’s music scene and considers his optimism as the driving force behind his music. 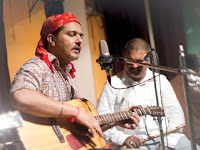 Picture: Sufi singer Arieb Azhar believes music connects people all over the world. Photo: Waheed Khalid. Thank you very much for posting this story on Arieb Azhar's work. I listened to one of AA's songs on you-tube with English translation included. It is called "Saif ul Malook" - Excerpt from Safar ul-Ishq (The Journey of Love) Mian Mohammad Baksh (1830-1904). A heart-expanding, intoxicating and joyful experience, a song filled with deep imagery. Glad you liked the story. And thanks for adding your comment, which will help others to appreciate his songs more.